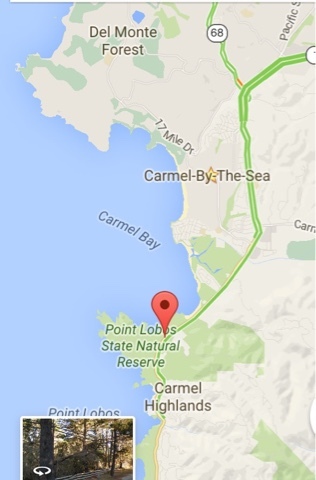 Point Lobo State Natural Reserve is south of Monterey, Carmel by the Sea, and Pebble Beach, CA. It is land that was once used for Abalone harvesting and canning and later for WWII training and as a state reserve it is now protected land. 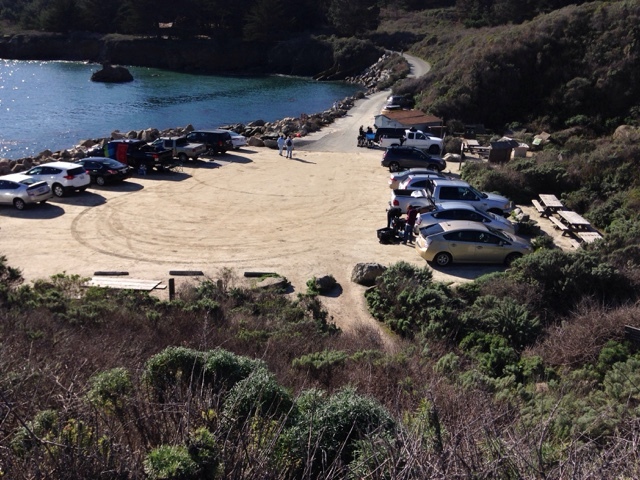 Parking in the reserve is distributed with small lots that fill up fast. I got the last parking space in this lot used by divers. 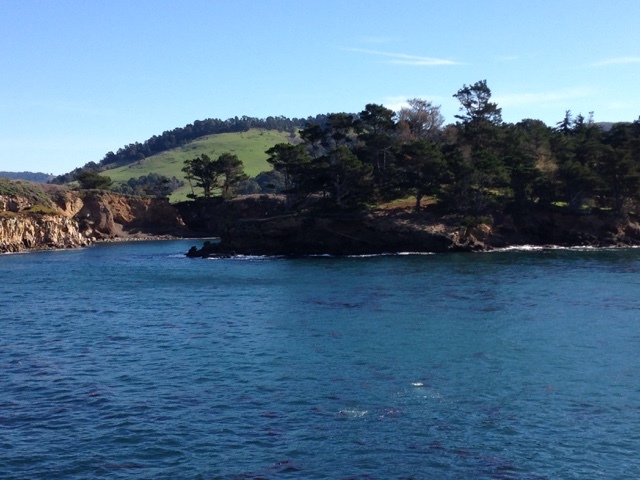 This cove is protected and makes for a good place for diving. 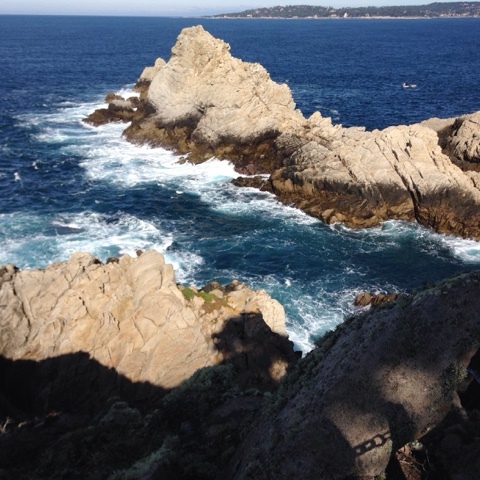 Looking north across the bay to Pebble Beach and in the forefront are rock outcroppings that can be found continuing south to Big Sur. 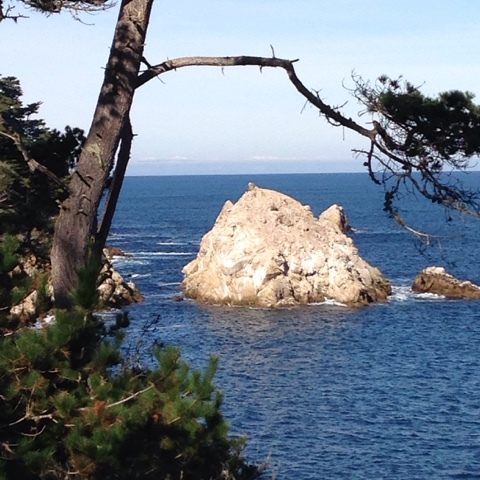 The branch on this tree helps frame the rock out in the ocean, just off shore. 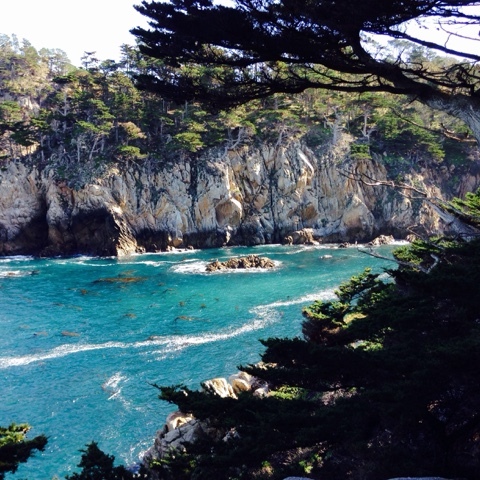 Further out on the peninsula is this smaller cove with aquamarine color water. It looks warm but it isn't. 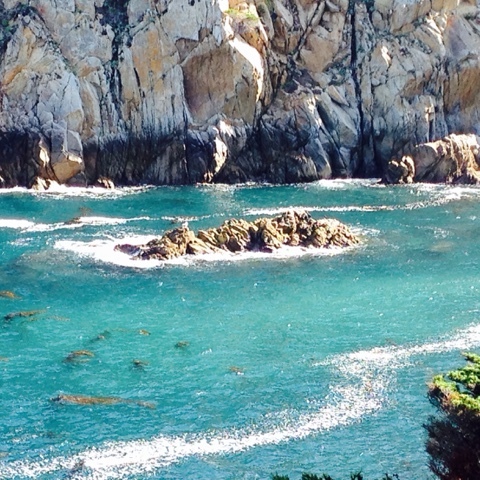 Another view of the cove. 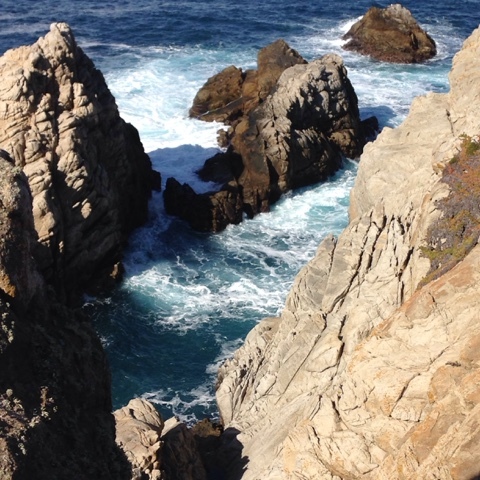 The hiking trail go along the edge of the peninsula and make for great picture taking. 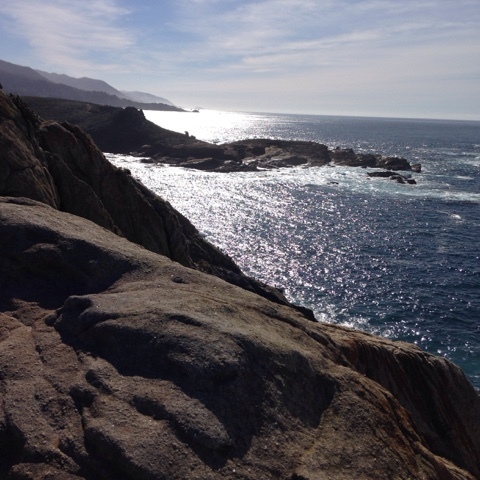 At the tip of the peninsula I take the above photo looking south towards Big Sur. The sun is low in the sky this time of year even though it is midday and that gives a different look to my picture. Out in the water from here there are seals and sea lions on the rocks. Sea Otters float with the kelp to relax. 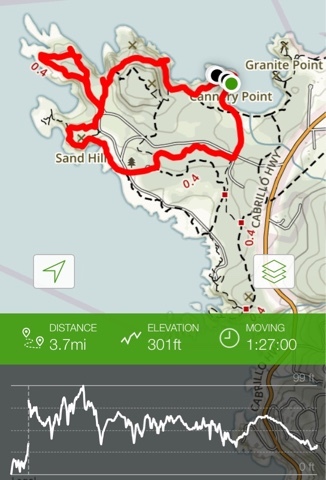 Here is the hike today. 3.7 miles and 301 elevation change. The State charges $10.00 and $9.00 for over 62 and it is well worth it as an entrance fee for vehicles. There is no charge for people that walk in so many choose to park on CA1 and walk on. We met no less than 4 volunteer dosers that were giving tours and explaining nature and wildlife. One had spotting scopes set up with one to see the sea otters and the other the sea lions. There is plenty left to explore for a return trip. Hi Brent! Your photos brought me back to 1989. Not much has changed! 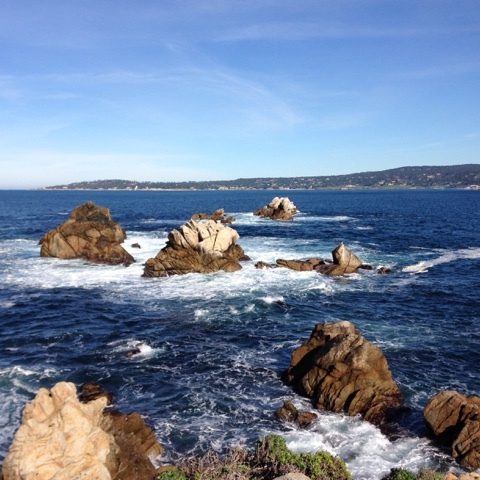 This area has so many places to visit along the coast. This is my third year visiting but with my son moving back to San Diego it's nice to take in as much of the remaining unvisited places as I don't know when I will be visiting again. I'm looking forward to returning. Hopefully, when I get the chance it will be as beautiful as ever!